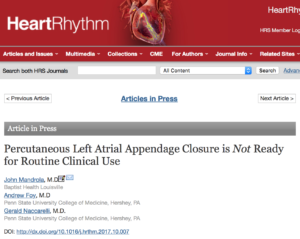 Our cautionary left atrial appendage occlusion (Watchman) editorial is now published in a prominent medical journal, called Heart Rhythm. My co-authors are Drs. Andrew Foy and Gerald Naccarelli from Penn State. It was a peer-reviewed version of my previous theheart.org | Medscape Cardiology column. Watchman and other similar devices are plugs that occlude the left atrial appendage in an attempt to reduce the odds of stroke in patients with atrial fibrillation. It was a nice idea but it did NOT work. 1. The noninferiority signal from the first Watchman-vs warfarin clinical trial, PROTECT AF, was driven not by a reduction of ischemic stroke but by a reduction of bleeding-related strokes and cardiovascular death. We make the case that these latter findings were spurious–a play of chance. The FDA agreed as they did not approve Watchman based on the PROTECT AF trial. Indeed, FDA reviewers found other technical problems with PROTECT AF, in addition to the spurious findings. 2. The FDA required the Watchman investigators do another trial. The second pivotal trial, called PREVAIL, also studied Watchman vs warfarin. But here FDA agreed to let investigators borrow patient-years from PROTECT AF, and allowed for a Bayesian analysis of PREVAIL. That meant PREVAIL began with a 97.1% chance Watchman was noninferior to warfarin. The cutoff for noninferiority was 97.5%. All Watchman had to do was get in the ballpark of warfarin and PREVAIL would have been positive. It did not. Watchman went the wrong way–in dramatic fashion. Sit down for this: After all the PREVAIL study patients had reached follow-up, there were now 14 clot events (13 strokes; 1 embolus to the body) in the Watchman group and only 1 stroke in the warfarin arm. The event rate was 7.6 fold higher in the device arm. The investigators called this endpoint the proof-of-concept endpoint. So … Watchman massively failed in its proof-of-concept test. The pivotal PREVAIL trial found that Watchman missed noninferiority in both its efficacy endpoints. 3. The third argument we made critiqued the meta-analysis that was published at the same time these dramatic PREVAIL findings came out. In our paper, we did our own meta-analysis on the two trials and found significant heterogeneity, which is a bad thing for meta-analyses. Heterogeneity–here, PROTECT AF went in a different direction than PREVAIL–means you are comparing apples and oranges. Most experts in statistics say high heterogeneity of the combined trials prevents drawing conclusions from the meta-analysis. What’s more, the meta-analysis did not refute the higher rate of ischemic strokes in the Watchman group. 4. Our fourth argument centered on the uncertain reasoning behind the idea of closing the appendage as a stroke-prevention strategy. Static blood in the appendage is not the only reason patients with AF have stroke. It turns out that thicker blood (hypercoagulability) and damage to the lining of blood vessel/atria (endothelial dysfunction) play significant roles in stroke. (See Virchow’s triad.) Patients with AF, especially those with other conditions, such as diabetes, coronary heart disease, valvular disease, hypertension, etc, harbor other reasons–besides the appendage–for having stroke. In short, appendage closure is a focal solution for a systemic problem. Thus, we are utterly not surprised it did not prevent stroke better than warfarin. Another drag on net benefits are the procedural complication rates. This is an invasive procedure, one that requires pushing stiff sheaths into the thin-walled appendage. The average rate of serious complications is about 6%. That is, if you use the best studies. Think about that; think about this as s a gamble. You get a device that is supposed to prevent future stroke (probability benefit) but you start the gamble with a 6% chance of serious harm. 6. Finally, we took on the prevailing idea of using the device in patients who are ineligible to take anticoagulant drugs. It’s crucial to know these patients were excluded from the trials. There is no reliable data on these patients. There is only speculation. One of the most damming pieces of evidence against the use of appendage closure in ineligible patients–besides the dangers of antiplatelet drugs–is that the likelihood of appendage sources of strokes go down as patients get sicker. I don’t recommend LA appendage closure. A clear-eyed view of the data suggest it’s worse than anticoagulation. And for those patients who cannot take anticoagulation, all the signals point to more harm than good. So–it’s 8 years since the publication of the PROTECT-AF trial, and almost a year since your article in theheart.org. What is the status of this device–is it actually being used? Bravo, John! Thank you for doing this important analysis. I’ve been skeptical of this concept for some time. Boston Scientific is spending millions promoting Watchman to cardiologists. About once a month I am invited to a weekend boondoggle put on by them to “educate” docs on the device in a nice hotel or resort in a place like Phoenix or Chicago. I’ve considered going just to report on how biased the presentation. Anyone whose doc is pushing the Watchman should ask the doc about their involvement in such things. Thanks Anthony. That someone as wise and skilled at the bedside as you agrees with my take, gives me great confidence. I think this procedure will be one of cardiology’s greatest mistakes. Right up there with absorbable stents. My gosh…they did a trial. It did not pass FDA muster–a pretty low bar when it comes to devices. So they did another trial. It did not even meet an utterly low bar of non-inferiority. Watchman missed both its efficacy endpoints Why? Because there were 7.6x the rate of stroke in the device arm. Some have said this is a complicated story. It is not. It’s only complicated if you let yourself be distracted from the basic story. Focal solutions don’t work for systemic problems.